Red car in sight? Drivers delight! 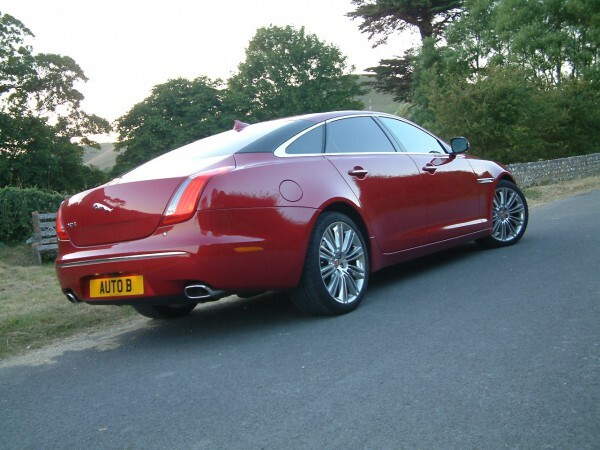 – The brilliant Jaguar XJ-L 3.0D Portfolio. Ever since passing my driving test some years ago, I have always preferred a bigger car. In times of adolescent youth when friends were rattling around in Fiestas or Minis, I would be lumbering around in a Rover. They would be getting the most from pin sharp handing, I would be appreciating the wafty ride, the rear cigar lighter or admiring my refection in burr walnut veneer – some say I have not changed one bit as the years (and the pounds) add on. The aforementioned larger car affair has recently come in rather handy as those lovely Guys `n Gals at Jaguar Cars saw fit to drop off an XJ for my delectation very recently. However this is no ordinary XJ ( as if the XJ can be described as ordinary!) but the long wheelbase XJ-L fitted with a 3.0 V6 turbocharged diesel and 8 speed ZF auto gearbox. Like I have mentioned, good job I like a larger car – the XJ-L is big in every way. 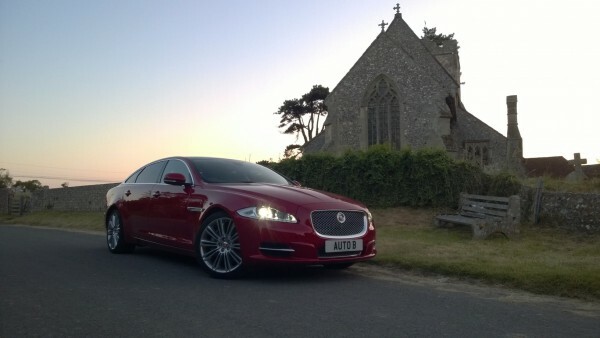 The XJ-L is certainly an imposing sight – All cool and no crass either. A deeply impressive machine. Visually, it sure makes a statement especially with the optional opalescent “Milan” red paintwork and polished 20″ rims, its certainly bold but cleverly restrained at the same time. Just the right amount of chrome and brightwork adorn the body while the striking mesh effect grille looks equally impressive in your rear view mirror as well as when viewing face on. The XJ-L looks every inch a premium car – with its price tag it should do of course, but there is nothing too brash or bling to detract from its first impressions being a very handsome machine. Fit and finish of the panels are as good as any German rival and the paint application is quite brilliant though a little orange peel effect can be seen on the plastic grille surround. The glazing is ripple free with privacy tint featuring on the rear windows. In summary – the right combination of stealth and statesman in appearance. The interior is a well made and tastefully finished abode – The look, the smell and the quality of the hand stitched hide is astounding – The ornate analogue clock is simply beautiful. A similar theme on the inside too, everywhere you look there are quality fixtures and fittings that just blend together perfectly. Wonderfully crafted hand stitched leather chairs that adjust in every possible direction but sideways – all electrically operated too – front and rear. The steering wheel is spot on in size for radius and thickness, its even heated too and all its functions for the cruise, hi-fi and telephone are easy to decipher and operate on the move without too much fuss. Instruments are the traditional XJ computer generated type that are crystal in clarity, reflection free and not too fussy in calibration. The driving position is almost perfect regardless of your stature but taller drivers may find the sunroof robs a little of the headroom. Rear occupants want for nothing – Seat is adjustable, air cooled, heated and massages too. Heaps of legroom with footstools, bluetooth headphones, picnic tables, LCD TV monitors and individual climate control to boot! Pulling the huge centre armrest down reveals yet more storage space and a pretty looking remote control. Your passengers behind even have their own entertainment settings, heating and air conditioning, window blinds, TV screens and bluetooth headphones – this Jaguar caters from the bored child to the Chairman of the Board. No matter where your eyes wander, the presentation is really quite something – even the roof lining and pillars are trimmed in tasteful alcantara. Moving along to the rear, the boot opens and closes on the push of a button. While being and wide and long, its not that deep but the combination of the spare wheel, auxiliary battery and of course, rear wheel drive, are the main reason for this. Its not a small boot, just not as huge as you might imagine. 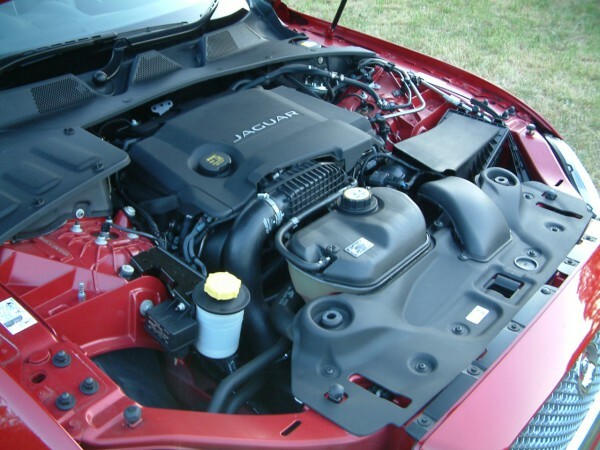 Lifting up the massive bonnet reveals the beating heart of the Jaguar. Its a 3.0 V6 turbo-diesel that wallops out a healthy 275Ps for your enjoyment while featuring the industry norm Stop-Start technology. She starts on the button (quite literally) and settle downs to a muted thrum on idle – its very refined and almost petrol like in sound, especially if you rev it hard in neutral. Everyday check items are idiot proof to locate though a little care to avoid spillage needs to be taken when topping the washer bottle with a watering can – the filler neck is right next to the edge of the off-side wing. My only under bonnet reservation is the overall appearance of the engine installation. There are too many exposed wires, plug connectors, hose-clips and pipes for a car at this price – a little extra protective / acoustic covering wouldn’t go amiss as it looks a little messy and disappointing to the eye. The turbine smooth V6 diesel is fast, refined and pleasingly frugal – Underbonnet view is a little untidy compared to rivals and lets the car down at this level. Under bonnet gripe aside, the 3.0 V6 does not let you down on the move. The XJ-L drives as she looks – without drama and a total joy. Performance and refinement is spot on in any circumstance while the 8 speed gearbox swaps the ratios with barely any detection. Only in full throttle mode does the engine note intrude on the ear, and even then its turbine smooth with a soundtrack almost as good as a Tarantino movie. Press the “dynamic mode” button and it all goes a bit mental as the throttle travel shortens. Full bore standing starts change its nature from a regal luxury carriage to an impressively fast car – with its rear end waggling like a naughty puppies tail, especially in the damp. As you would expect of a Jaguar, the brakes are sure-footed, progressive and fade free. The air suspension allied to the long wheelbase offers a ride that’s firm but controlled at low speeds and supremely cosseting when cruising at speed and the engine is barely cantering – just 1400rpm shows at the legal 70. Motorway refinement is nothing short of outstanding, the ride, the silence and the comfort are all without fuss or compromise, again, you would expect nothing less. I used plenty of back roads via the quaint villages of Northampton and Bedfordshire finding nothing to complain about with the XJ-L handling. Quick steering with good feedback with none of the electric assistance that tends to kill the feel at the rim thanks to the use of a traditional hydraulic power rack. The steamroller like 275/35/20″ tyres offer a Barnacle grip on tight bends – so good in fact that car almost seems to shrink as you go faster! Okay? so it must be thirsty then? … well actually no. Despite some varied driving on all manners and types of roads, the XJ-L 3.0SDV6 covered almost 700 miles on test and averaged a very credible 38mpg overall. 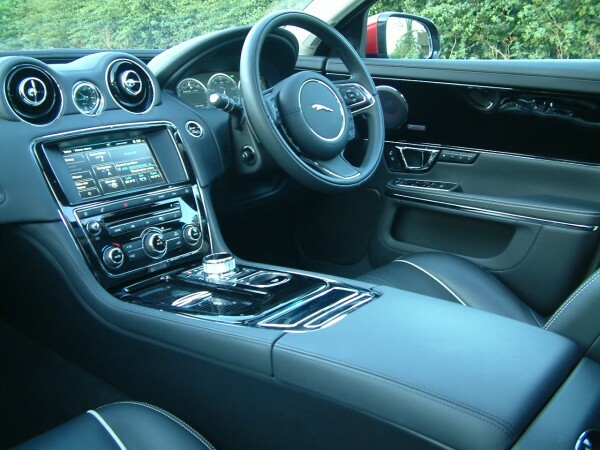 So is there any point to buying a petrol Jaguar XJ then?… well, again, no – the XJ-L is refined, powerful, pleasingly economical and performs every task with sheer style and prestige – all boxes ticked for a large executive car. But what’s really clever is the way the Jaguar goes about its business. It looks good without being twee, it has a dash of aggression without being in your face and has all the right balance of technology and substance that all works right out of the box – its more flair than flash. There is little to dislike about the Jaguar. One or two things could do with a little more polish such as the under-bonnet attention to detail for example and some minor quality / ergonomic issues – the panel rheostat and rear fog lamp switch are awkward to reach and feel cheap, but nothing to detract from what really is a joyous and beautiful British car. Wanna know what’s really clever? it takes the executive fight to the Germans and stands toe to toe with best of them with a certain sense of style only us Tommies can pull off! Plus Points: Great looking – Ultra refined – Economical – Strong performance – Space – Comfort – Outstandingly supportive seats – Able chassis – Interior attention to quality and detail – Makes you feel special – Restrained opulence rather than down and out bling. Reservations: You’ll need a big garage! – Under-bonnet view is little messy – Some slight quality / ergonomic matters – Slab sided doors look prone to minor dings – Wheels get dirty very quickly – Care needs to be taken when parking – Headroom for taller drivers is a bit tight. Previous Defending our Country and safeguarding our motor industry.